For over 28 years, Nicola ‘Nikki’ Emerich, founder and artistic Producer, has led the theater through thick and thin - including 3 hurricanes! She begins her ‘retirement’ from the theater this year. Attend and honor her lagacy as well as the late Brian Emerich, Pistarckle Theater Founder, Architect and Community leader. We will also celebrate the late B. Greg Miller, long time theater Board member, supporting donor, entrepreneur, Rotarian, and activist. Purchase tickets online, click here, or call the theater (340) 775-7877. VIP tickets: $125 pp, includes; entry for one adult, one Live Auction Paddle, and 10 free tickets foor a chance to win raffle items. Limited Seating, only 100 tickets will be sold. Now accepting donations for Auction and Raffle Items, program advertising, and sponsorships. Champagne Reception, Silent and Live Auctions, Gourmet Hors d’oeuvres, surprise entertainment, music by Goodvibes band, guest appearances from the casts of Dream Girls, Evita and Lion King Jr. BOTH SATURDAY & SUNDAY EVENTS SOLD OUT! Note: Open Seating for individual tickets. For those desiring a reserved table of 8, purchase must be done with one transaction for all 8 tickets (i.e., individual ticket sales will not be compiled into a reserved table of 8). 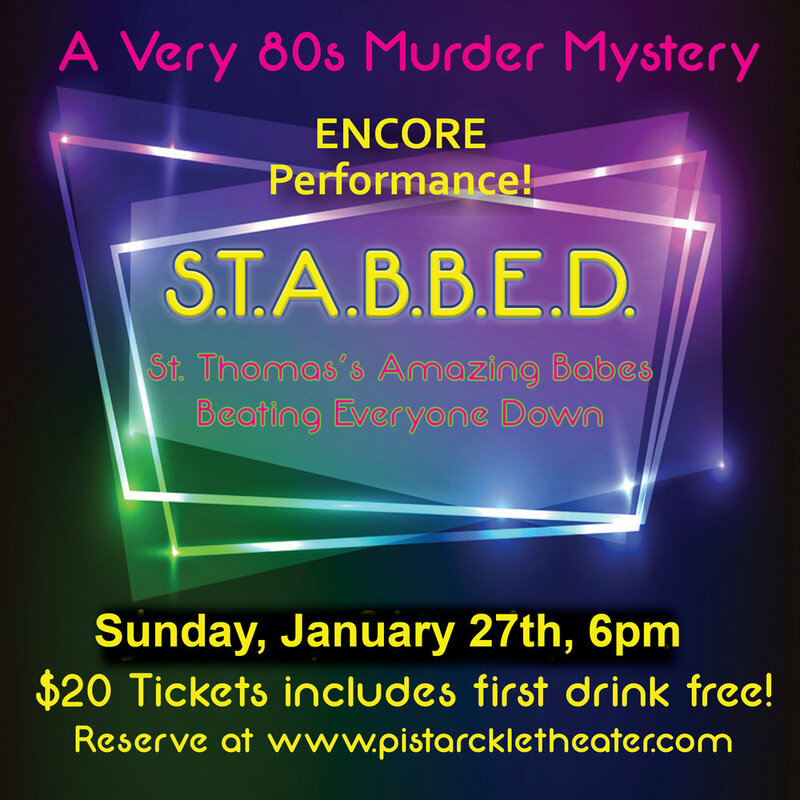 The Encore Performance - the fourth installment of our popular Whodunnit Murder Mystery Theater events - has been scheduled for Sunday, January 27, at 6 p.m. Seating is limited (60 total), and we usually sell out quickly. As with our past two events, our Whodunnit Author and Director is the talented island resident and actor Julie Baber. For the last two events, we also launched an encore performance the next day, a Sunday Matinee. Theme: A tribute to G.L.O.W. - the Gorgeous Ladies of Wresting. Fun To Do (but not mandatory) - Dress Up In 80’s garb. Our Whodunnit events feature an originally written playlette, interactive audience participation to help ‘solve’ the murder mystery, a complimentary first drink, light snacks, and loads of fun! Tickets are $20 pp, will be available online soon (For those 18+ please, and cash bar will be available). Stayed tuned and visit our website - and Facebook Page - often for updates. 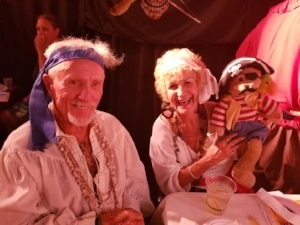 Long time theater patrons Marty and Carol Tuohy dress the theme for a past Whodunnit! The all-star cast, students of the Pistarckle Playwrighting Camp, will present their collaboratively-written play' "Driving Me Crazy," on Friday, August 17th, at 6 p.m. It's a comedy about first-time drivers, and promises to be seriously entertaining. Student directors are Kinnisha Coulanges and Jackson Auchunclass. Camp Instructor VI playwright Susan Hunter has been guiding the students for the four weeks summer camp session. This program is annually supported by the VI Department of Labor. Tickets are just $10 per person both both adults and children. Click here for online tickets, or call (340) 775-7877. The Curse of the Trompeuse Treasure, Whodunnit Murder Myster Night. Another Pistarckle-After-Dark event, Repeat Performance SUNDAY, JUNE 10th, 4 p.m. Please go to our Contact page and join our emailing list, so we may let you know about other upcoming events. peculiar passengers and conspiring crew members. secrets, scandals and seafaring scoundrels. 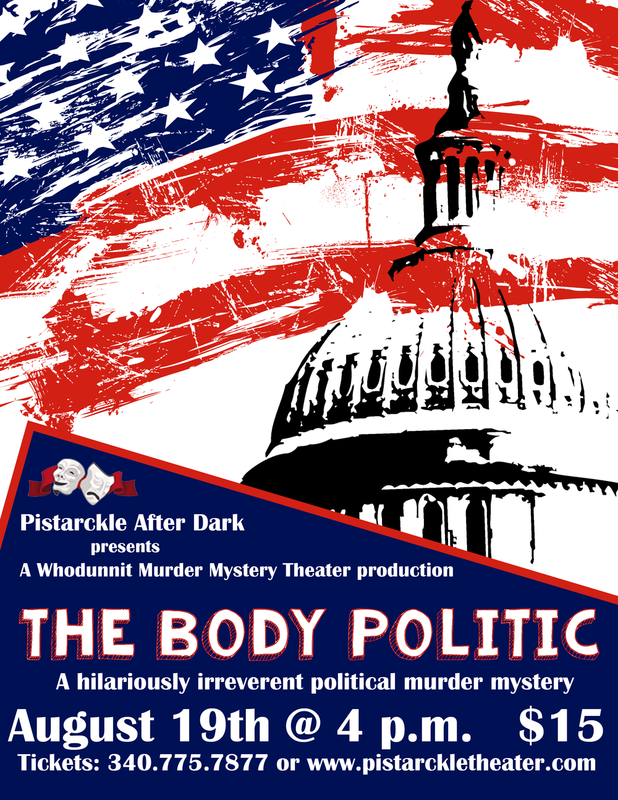 The ever-popular Murder Mystery Night is back at Pistarckle Theater! Join us to solve the mystery on Saturday, March 10, 2018 - beginning at 6 p.m. Tickets are $10 pp, includes light snacks. Our fabulous Lobby Concession will also be open for purchase of beverages (CASH ONLY at Concession, please). Our Cruise Ship Theme is "Mystery of the Seas: Whodunnit? @ Pistarckle Theater"
Description: After a luxurious week at sea, all those on-board the Mystery of the Seas are ready for a night of romance and intrigue at the Captain’s Cocktail Reception—an extravagant affair to top all others. Adrift on the ocean, there is no better place to escape your troubles…or for a murderer to strike. Could the killer be the commanding captain who has found his personal life out of control? A seething spouse who has discovered the dastardly deception of their darling? Or possibly a conniving contestant who will do anything to be crowned ambassadress by the cruise line? Trapped at sea, no one is safe and everyone is a suspect. As secrets are revealed, everyone’s innocence will come into question as the assassin tries to appear angelic. Sharpen your sleuthing skills, for that’s what you will have to rely on to call out the killer! Various prizes at the end of the evening include tickets to our upcoming play, "The Color Purple, the musical," 2018-19 Subscriber Passes, and more...for sleuthing solutions, best dressed, most outrageous solution...and more. St. Thomas, U.S. Virgin Islands –On October 23rd, the “Pistarckle Children’s Hurricane Recovery Project” launched with split session therapeutic and arts day camp classes for 7 to 12 year old youth. Located in Tillett Gardens, 4126 Anna’s Retreat, St. Thomas, the theater day camp included a 3 hour morning - or afternoon - session, Monday through Friday, with a healthy snack and several classes in the performing arts. There was a nominal fee per child, with some scholarships awarded. There were many donors who stepped forward to make those scholarships possible. The Camp's mission is to help children express and channel their traumatic life experience and feelings by therapy through the arts. Classes are being held in music, singing, acting, dancing, writing, poetry, puppetry, sand art and yoga. 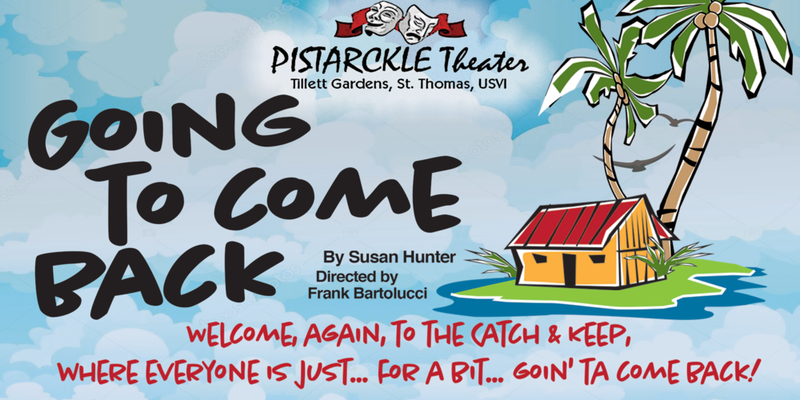 Any additional Donations should be made payable to Pistarckle Theater, earmarked for the Pistarckle Children’s Hurricane Recovery Project, and mail or drop off to 4126 Anna’s Retreat (Tillett Gardens), St. Thomas, VI00802, ATTN; Priscilla Lynn/Marketing Director. Donations make also be made via the PayPal Account at accounting@pistarckletheater.com, noting that it is for the “Pistarckle Children’s Hurricane Recovery Project.” For more information, call or text the theater’s temporary contact number at (340) 227-8451. The popular STARZ Leadership/Playwrighting Camp is sponsored by The Virgin Islands Department of Labor. This camp focuses on developing life and career skills through playwrighting and theater performance via a model of instruction known as active learning. ALL 3 PERFORMANCES ARE SOLD OUT! Be sure to get your tickets for December's "Best Christmas Pageant Ever" early - as our holiday play is usually a sell-out, too! This 6-week program focuses on teaching all aspects of musical theater, singing, dancing, and acting, as well as the technical theater, lighting and sound design. Class size limited. Two Full Scholarships still available. It all begins with the Art of the Audition! Prepare your audition, song, practice acting and dance. Strongly recommended for all new campers. $50.00 for all 3 days. 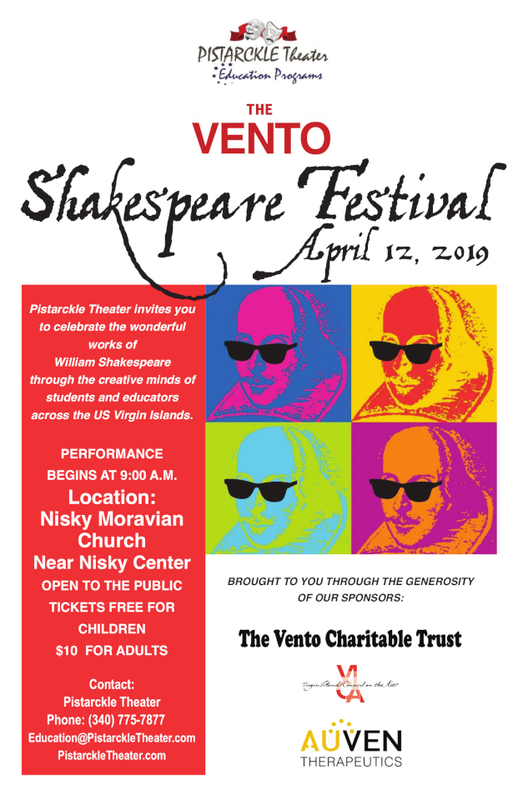 CAMP DATES: June 14, 15, 16 3:45 p.m. - 5:00 p.m.
St. Thomas, VI -- Virgin Islands playwrights are getting a chance to feature their original drama and comedy plays at theater's third annual festival. Pistarckle Theater will present the plays of three new playwrights at its 2017 New Playwrights Festival on Saturday, May 20 at 7:00pm. Earlier this year, Pistarckle issued a call for new never-produced or staged plays resulting in 9 entries that were reviewed by the Festival committee. Three were selected amongst the entries. 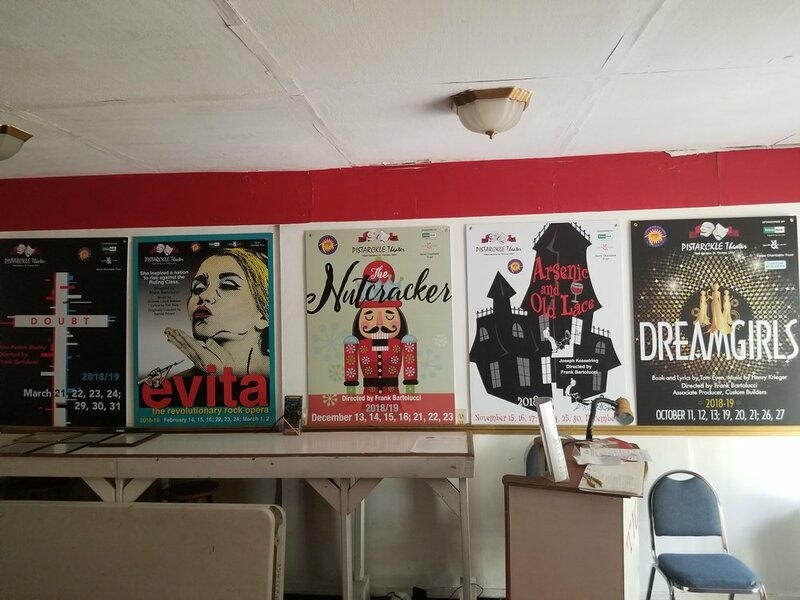 Nicola Emerich, Founder/Artistic Producer, said “Pistarckle Theater’s goal for the New Playwrights Festival is to provide an opportunity for up and coming playwrights to present their original work on a professional community stage. We are thrilled that as a result of finding these great talents, over the years, two of the Festival's plays have been added to our regular theater season. 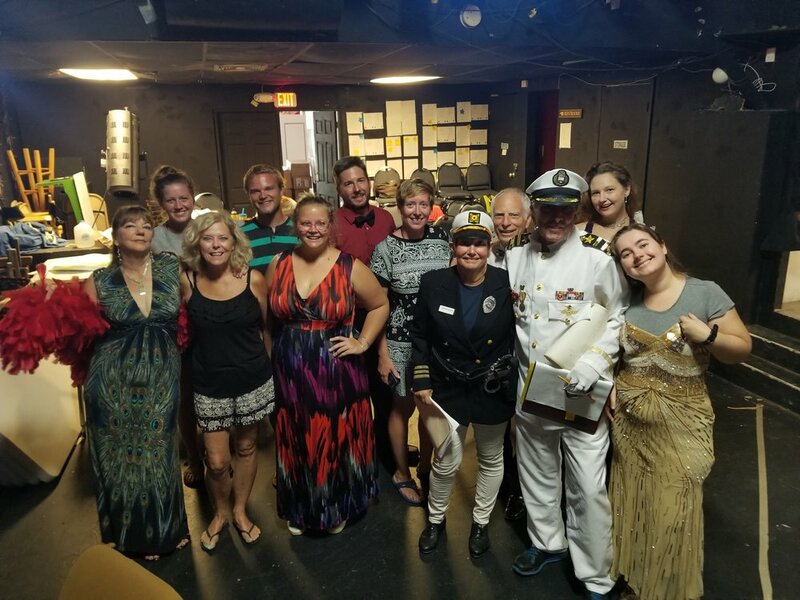 Catch and Keep is an original play that was featured last year at our Festival and it will be opening this week at Pistarckle.” Two Catch & Keep performances remain: Friday and Saturday, May 12 and 13 – 8 p.m. The 2017 plays to be presented on May 20 are Matthew Hamilton-Kraft’s Alternative Facts, Stacey A. Bryan’s Bone is for Dog: Meat is for Man, and Dr. Gillian Royes’ How to be an Immigrant. Stacey A. Bryan was also featured in the 2015 Festival and her play, Sad Mangoes, was included in Pistarckle's 2016 theater season. Matthew Hamilton-Kraft (Alternative Facts) is an eight time produced playwright and life long writer. In 1999 Matt won an ACTF/Kennedy Center New Playwright Award for his debut play, "Just Getting Even", a drama about male and female relationships transitioning from high school to college. Matt won a Festival of The Lakes Playwright Award in 2001 for the romantic comedy, "Getting Out: Lost in Adirondackia". In 2004, he was awarded a Robert H. Jackson Fellow Award for the educational drama, "My Daddy Says", which highlighted racial tensions when minority children move into a rural white suburb. Other original plays that Matt has penned include: The romantic comedy, "The Giraffe Who Came To Dinner", (original production 2001), a satirical farce, "The Truth Isn't Out There (original production 2002), The Metaphysics of Poetry, a dramatization of the poems and fairy tales of Oscar Wilde, (original production 2003), Tax Cut, a political comedy (original production 2004) and in 2002, Matt collaborated with notable Western New York author Paul Leone to adapt the historical fiction book, "if nothing happens", into a stage play. In addition to playwright credits, Matt has over 30 professional acting and directing credits. Favorite roles include Estragon in Waiting For Godot, John Worthing in The Importance of Being Earnest, Jerry in The Zoo Story and Charlie Baker in The Foreigner. Notable directing credits include, The Miracle Worker, The Diary of Anne Frank and The Dirty Old Man. In 2006 Matt "retired" from theater to join responsible society and work in education and anti-poverty while being a dad to young boys and a husband to a dedicated teacher. Matt moved to St. Thomas in August of 2017 with his wife Katrina and boys Nolan and Lliam. Pistarckle and Nolan has slowly coaxed him back into theater. Stacey A. Bryan (Bone is for Dog; Meat is for Man) is a multi-generational St. Thomian. She attended Peace Corps Elementary School and graduated from Sts Peter and Paul High School. Stacey also attended the InterAmerican University in San German, Puerto Rico. She wrote the play, Sad Mangoes that was produced at Pistarckle Theater in 2016. Stacey loves stories and tales from the Caribbean. Stacey sincerely thanks her beloved family and friends for their wonderful inspirations and she is so proud to be chosen as a participant of the Pistarckle Theater’s New Playwrights Festival. Stacey A. Bryan dedicates this play to the life of her Granny, Ann Josephine Ledee, the beautiful pink rose with thorns. Gillian Royes, PhD (How to be an Immigrant) Born in Jamaica, Gillian Royes furthered her education in the United States, completing a doctorate in Communications at Emory University and ending her teaching career at the University of the Virgin Islands. The author of a cozy mystery series published by Simon and Schuster, Gillian has also written two plays, HOW TO BE AN IMMIGRANT and THE MAN WHO TURNED BOTH CHEEKS. She wrote the screen play for the film Preciosa, shot in St. Croix by director Peter Sagnia (2016), and is working on a pilot for a TV series based on her books. We are looking for (4) West Indian and/or Jamaican male adults; (ages range from early-20’s to mid-30’s) and for (3) West Indian female adults; (ages range from late 20’s to late 30’s) and (1) Jamaican female senior (mid 50’s to mid 60’s) for two of the three plays selected. 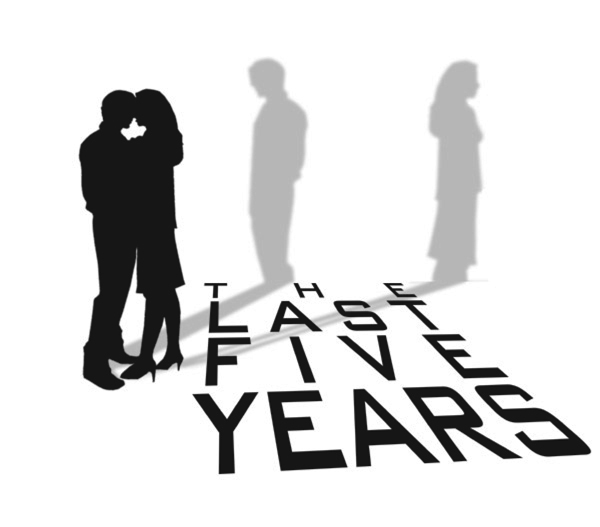 The third play requires (2) adult males (mid-30’s to mid -50’s) and (2) adult females (mid-30’s to mid-50’s), and does not require a specific ethnicity. The performance will be a staged reading from the scripts of Act One of the three plays. There will be 2 rehearsals for each of the 3 plays selected the week of May 14 -19 from 6:30 to 9:30 p.m., and the performance will be on Saturday, May 20th at 7:00 p.m. It's your time to shine! Pistarckle Theater is holding an open casting call on Sunday, October 16th at 6:30PM. There are roles for all ages so don't be shy, come give it a try!